We move on this week to Italy as we visit the system on the island of Sicily operating around Palermo. Only just over three years old the network is the second to run in the city following on from the first which closed in 1947. 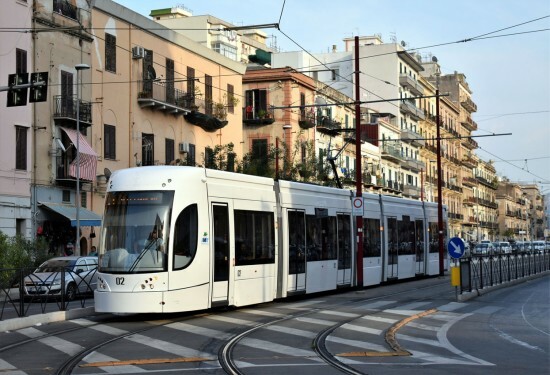 Construction on the new generation tramway for Palermo started in 2007 but it wasn’t to be until December 2015 that the first trams would run in passenger service. There are currently four routes – three of which, numbered 2, 3 and 4 – start at the station of Palermo Notarbartolo and serve the suburbs to the west and southwest. Route 1 is separate and runs south from Palermo Centrale station to the out of town Forum shopping centre at Roccella. A fleet of 17 Flexity Outlook five-section trams operate the entire system, with all finished in an all white livery. In this photo we see 02 running along the central reservation of Corso dei Mille, just before it turns into the Stazione Centrale terminus on 17th September 2018.